Honolulu – May 16, 2014. The following article was printed in The Hawaii Herald – Hawaii’s Japanese American Journal (Vol. 35. No. 10). Here is an article from the Hawai‘i Herald’s special edition honoring the 70th Anniversary of the 442nd RCT. 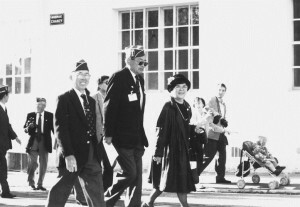 First photo: Genro Kashiwa (far left) and his L Company buddy Howie Hanamura walk in the parade in Bruyeres with tour group leader Dorothy Matsuda (Photo by Karleen C. Chinen). Second photo: In Italy, 11 of the 14 veterans in our group stopped to take a group photo with Mount Folgorito (first peak on the left) in the background (Photo by Muriel Kashiwa). Stories and images are courtesy of the Hawai‘i Herald. Genro Kashiwa was not in the best of health when he boarded the plane for our trip to Europe last fall. Eight days earlier, he was in a hospital bed, recovering from a bleeding colon. 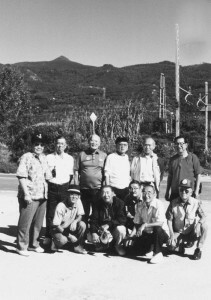 But the recently retired lawyer insisted on making this pilgrimage — his first since the war. Genro, his wife Muriel and I became fast friends on the trip. From early in our journey, I often observed him studying maps and writing in canary-colored legal tablets. When we talked, his comments usually had more to do with the mechanics of a battle — the strategy, the structure — or the humorous moments he recalled. Getting Genro to talk about how he felt was somewhat challenging. But with each passing day, that stoic Nisei exterior melted away. As I listened to him at the end of our days in the Vosges mountains, I realized how therapeutic this journey has been for him. 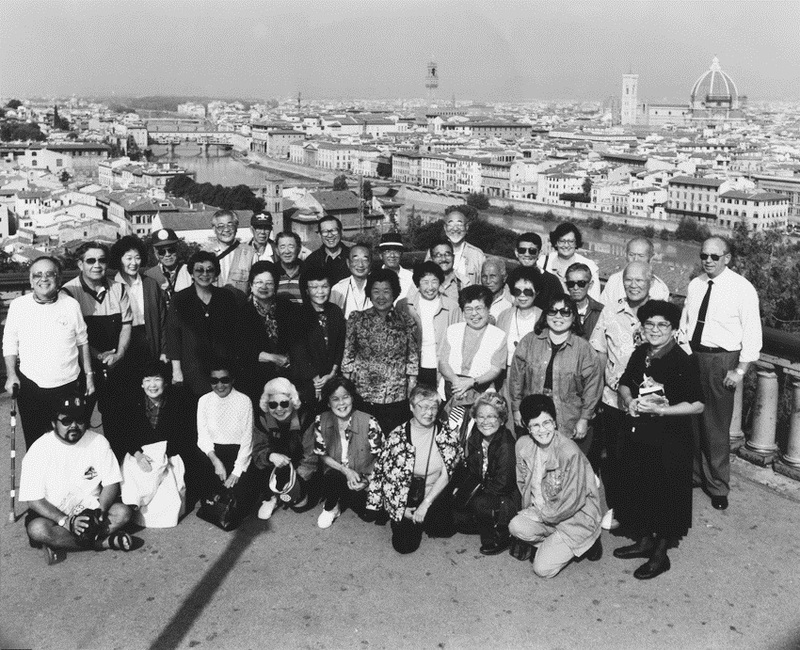 Photo of the Veterans and their wives with the city of Florence, Italy in background. When we began our journey to Europe, my focus was on the veterans with whom I would be traveling for the next 20 days. This trip belonged to them. I was there to walk with them and record their memories and impressions. But what moved me as we bussed from historic landmarks to tiny little towns where these men had fought a half-century ago as young men barely out of teens, was the impact the trip had on their wives. They were not disinterested tag-alongs on this journey. Not once did I hear any of the women say, “Yeah, yeah, you go with the boys. I’m going shopping.” Not once. These wives were active partners in this journey back in time and it turned out to be as meaningful for them as it was for their husbands. Here is an article from the Hawai`i Herald’s special edition honoring the 70th Anniversary of the 442nd RCT. Stories and images are courtesy of the Hawai`i Herald. 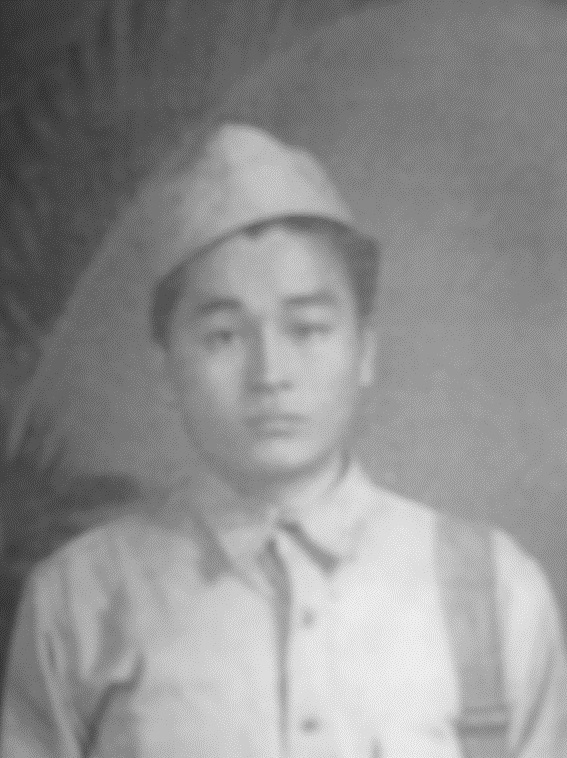 Minoru “Chappy” Kishaba as an 18-year-old 442nd RCT volunteer — Photo Courtesy Kishaba family (left). Chappy Kishaba at a ceremony in the forest outside of Biffontaine — Photo by Karleen C. Chinen (right). Chappy and I finally had a chance to talk at length in Biffontaine. We had stepped outside the tent that had been set up for the luncheon banquet. None of the buildings in the town could accommodate the nearly one thousand people who had converged on this small French town to commemorate its liberation 50 years earlier. Chappy and I went outside to take a break from the festivities and get some fresh air. Here is an article on the 100th Battalion’s newsletter. Story and images courtesy of the Hawai`i Herald. Volunteers gather at the clubhouse to collate and fold issues of the Puka Puka Parade. 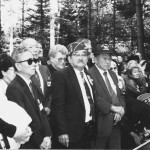 Pictured are, clockwise from left: Elsie Oshita, veteran Ted Hamasu, Kimi Matsuda and an unidentified woman. This year, the Hawaii Hochi marks 100 years since Kinzaburo Makino began publishing the Japanese-language newspaper in December of 1912. Not too far behind the Hochi in publication years is the 100th Infantry Battalion’s monthly newsletter, creatively named the Puka Puka Parade. 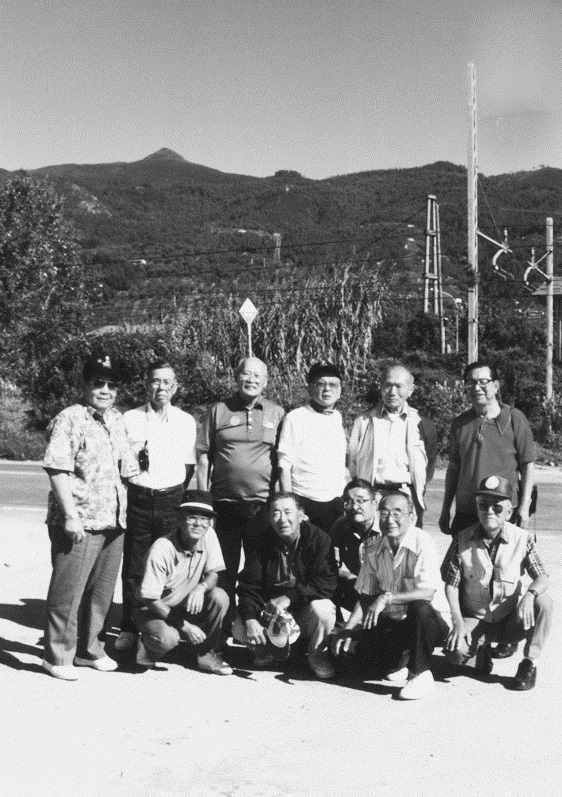 Since April 1, 1946, the veterans club has kept its members and their extended ‘ohana informed through the PPP. 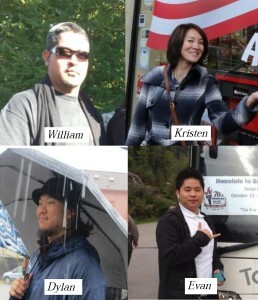 “We have quite a large team [that works] largely behind the scenes,” said president Pauline Sato, who serves as overall editor and liaison to the club’s board of directors, which is made up of the various chapter presidents. 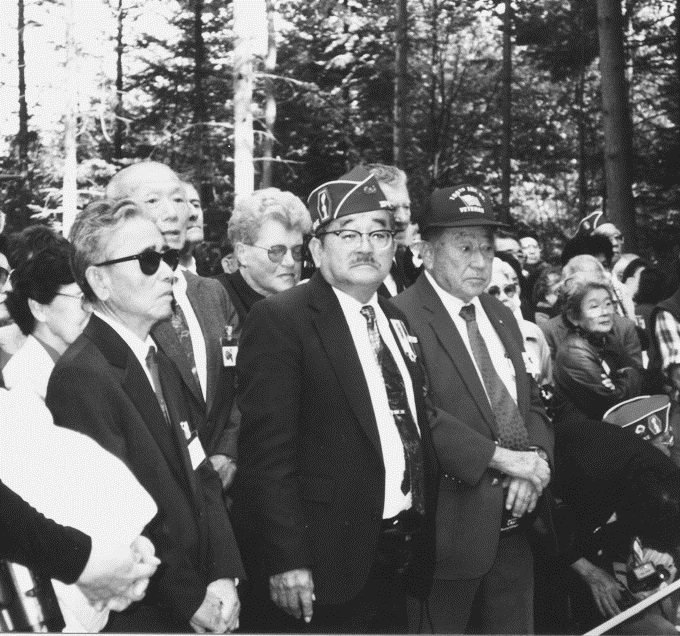 Here is an article that reflects on the Japanese-American Internment. 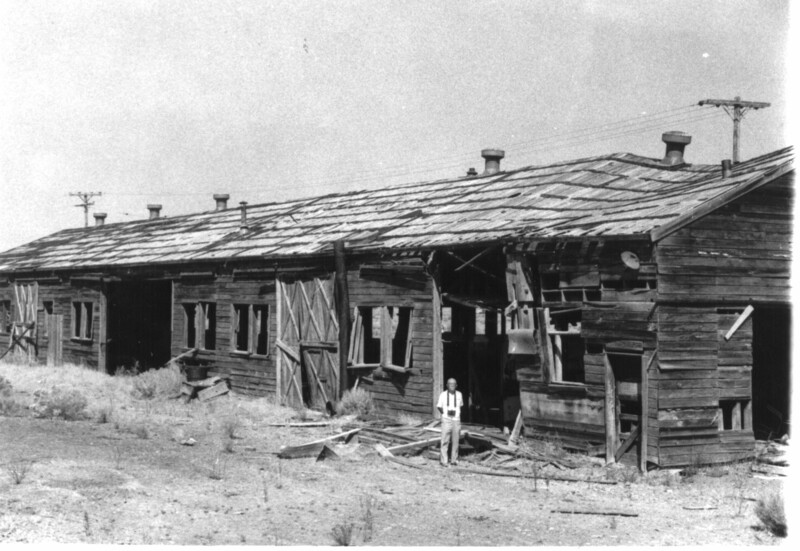 Hawaii Hochi writer Iwao Kosaka in front of an old mess hall at Tule Lake in 1988. Story and image courtesy of the Hawai`i Herald. The World War II exploits of the Varsity Victory Volunteers, 100th Infantry Battalion/442nd Regimental Combat Team, Military Intelligence Service and the 1399th Engineer Construction Battalion are the stuff of legends and are even more gripping when retold because of the extra burden of race that the Nisei soldiers carried with them into battle. They fought not only fascism and totalitarianism, but hatred and prejudice in their own country. But knowing that the eyes of America were on them, the Nisei soldiers fought bravely against the armies of Nazi Germany and Imperial Japan. June 5th, 2012 marks the 70th Anniversary of the formation of the 100th Infantry Battalion. Here is an article from The Hawaii Herald archives published on the 50th Anniversary (1992). 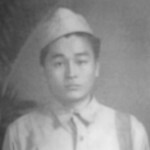 The following historical profile on the 100th Infantry Battalion is excerpted from the chapter titled, “The Nisei Soldier” in Roland Kotani’s 1985 book, “The Japanese in Hawaii: A Century of Struggle.” The book was published by the Hawaii Hochi, Ltd. And was designated the official booklet of the Oahu Kanyaku Imin Centennial Committee. On the barren Italian hillside, Masayuki “Sparky” Matsunaga huddled behind a terrace wall and prayed for the dawn. He could barely move his wounded leg. But the darkness seemed to be lifting from the corpse-strewn battlefield. The young man from Hanapepe wondered if he’d ever be able to do anything about his Kauai High School teacher’s advise that he should become a politician. 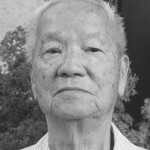 His father had always said, “Kuro ga ate fukai jinsei ga wakaru,” “Deeper understanding of human values comes only through personal suffering.” As he pulled his jacket close around himself, Masayuki though he’d become a compassionate politician with a definite understanding of human suffering-if he survived this war. 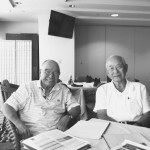 Here is an article from the Hawaii Herald on the efforts to preserve the building where Japanese-American U.S. Army MIS members were trained. 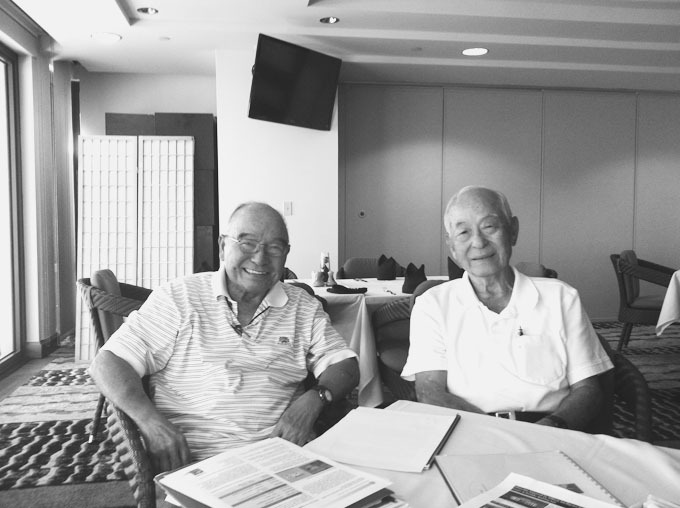 Hawai‘i fundraising chair Andrew Sato (left) with Herbert Yanamura, both MIS veterans. 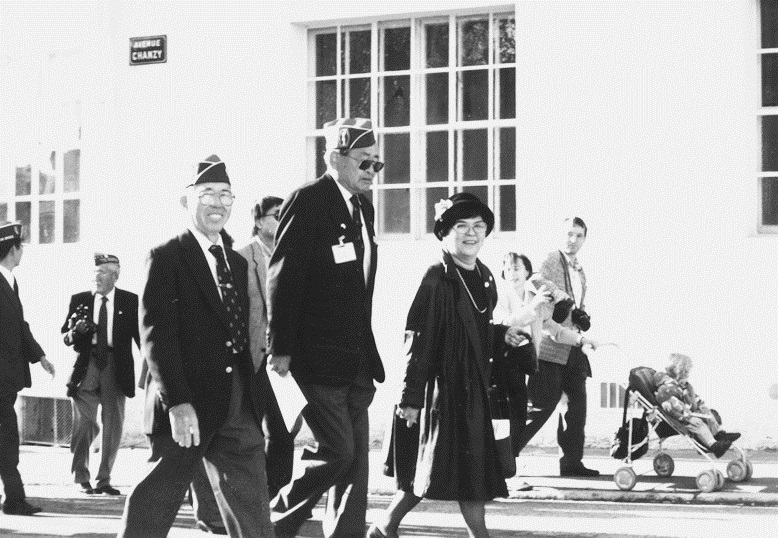 In 1991, on the 50th anniversary of the formation of the Military Intelligence Service, the National Japanese American Historical Society advocated for preserving an old warehouse structure known as Building 640 in the Presidio of San Francisco. 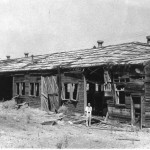 It was in that now-historic building that the first Japanese American U.S. Army members were trained as linguists to serve in the Pacific theater. Twenty years later, NJAHS’ vision is very close to becoming a reality. If all goes according to plan, the organization will open the MIS Historic Learning Center next November, culminating years of “arduous” work in honor of the MIS, whose service as interpreters, translators and interrogators in the Asia Pacific theater in World War II was credited by Gen. Charles Willoughby, G-2 chief in the Pacific, with saving a million lives and shortening the war with Japan by two years. Here is an article from the Hawaii Herald on the 1399th Engineer Construction Battalion. 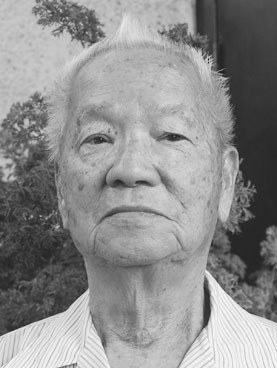 Yasuo Mito, a member of the Battalion recalls his experiences. Stories and images are courtesy of the Hawaii Herald. The view while driving up Wahiawa Heights is almost nondescript. The rows of houses on either side of the street are occasionally broken up by pasture or farm land. Along the route are storage water tanks used to supply the water needs of nearby homes and businesses. The trees and tall grass growing in front of the tanks help them to blend in with the landscape. What’s unique about one of these water tanks is that it was built in 1944 by soldiers in the 1399th Engineer Construction Battalion — and it’s still being used. For any structure to remain standing after nearly 70 years is impressive, but even more amazing is that the water tank was constructed with the hard work and sweat of young Japanese American soldiers largely inexperienced in construction, using only hand tools and the occasional power Dewalt cutoff saw. 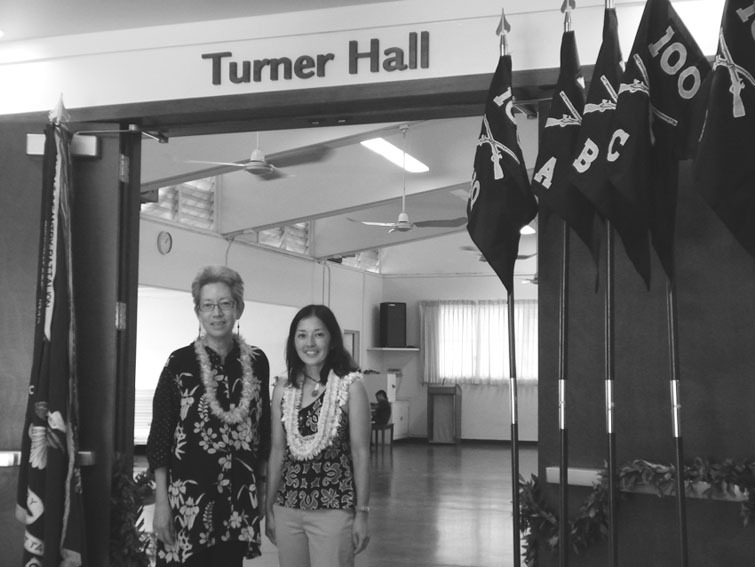 Here is an article from the Hawaii Herald on the 100th Infantry Battalion’s Education Center. Susan Muroshige (left) and Pauline Sato at the entrance to Turner Hall in the 100th Infantry Battalion Veterans clubhouse. Turner Hall is named for the 100th’s first commanding officer, Col. Farrant Turner. Thanks to a $1 million grant awarded by the state of Hawai‘i Department of Defense in 2008, the 100th Infantry Battalion Veterans clubhouse is looking a lot different these days. This is the first of many articles that have been published in The Hawai`i Herald. Here is the cover story on the AJA Congressional Gold Medal — Courtesy of The Hawai`i Herald. They now belong to an elite group of world citizens — honored by the Congress of the United States with the nation’s high civilian award for service — the Congressional Gold Medal. Past awardees had included U.S. presidents, astronauts, the Dalai Lama, baseball great Jackie Robinson, Pope John Paul II, and Dr. Martin Luther King and Coretta Scott King, among others. Google “Congressional Gold Medal” on the Internet and you will find their names — the 100th Infantry Battalion, 442nd Regimental Combat Team and the Military Intelligence Service — America’s newest Congressional Gold Medal heroes.